It doesn't seem to matter who's playing QB for the Tampa Bay Buccaneers. Turnovers and a leaky defense are hindering the team's chances of being successful. TAMPA, Fla. (AP) — Jameis Winston or Ryan Fitzpatrick. It doesn’t seem to matter who’s playing quarterback for the Tampa Bay Buccaneers. Turnovers and a leaky defense are hindering the team’s chances of being successful. The Bucs (3-7) have dropped seven of eight games following a 2-0 start, vacillating back and forth between Winston and Fitzpatrick, who’ve played well enough at times that Tampa Bay leads the NFL in passing yards and total offense. The quarterbacks have also been turnover-prone, with their mistakes compounded by a porous defense that not only has yielded a league-high 329 points but hasn’t forced a turnover in the past seven games. Coach Dirk Koetter, who has not announced who’ll start this week against the San Francisco 49ers, conceded Monday that the team’s turnover differential of minus-23 through 10 games is a mind-boggling statistic. “It’s boggling on both ends. That we have that few takeaways and that many giveaways. It’s a ridiculous number to have the disparity be that much,” Koetter said Monday. 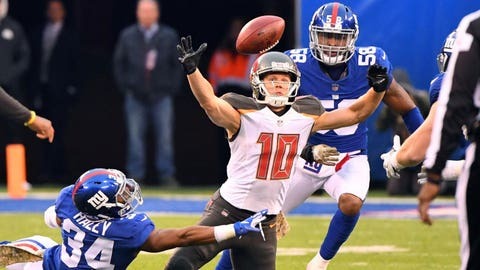 Koetter changed quarterbacks for the third time this season, benching Fitzpatrick during Sunday’s 38-35 loss to the New York Giants. Winston, benched last month after throwing four interceptions in a loss at Cincinnati, entered the game after Fitzpatrick was picked off three times in falling behind 24-7 and led touchdown drives on four consecutive possessions. Koetter said Monday he’d made a decision on which quarterback will start Sunday’s home game against San Francisco, but he did not want to announce it because he had not yet talked to Winston and Fitzpatrick individually. “Even though I know what we’re going to do, I’m not going to be able to say it today because I would never tell the media before I told the quarterbacks themselves,” Koetter said. The 35-year-old Fitzpatrick began the season as the starter while Winston, the No. 1 overall pick from the 2015 draft, was serving a three-game suspension for violating the league’s personal conduct policy. Since topping 400 yards passing in back-to-back wins over New Orleans and Philadelphia, Fitzpatrick has lost five consecutive starts. Winston is 1-2 as a starter this season and also has played twice in relief of Fitzpatrick. The common denominator in the team’s seven losses is the team has fallen behind early and been unable to escape double-digit deficits. In wins over the Saints, Eagles and Cleveland Browns, the Bucs led most of the way before holding on at the end. Fitzpatrick said after Sunday’s game that he was proud of the way Winston led the team back against the Giants. “It’s not easy to not have any preparation and be working with the scout team and get thrown in there during the middle of the game,” Fitzpatrick said. Winston, meanwhile, would not speculate on who might start against the 49ers.